Is product placement in House of Cards the new future of advertising? Netflix’s “original” new drama House of Cards is making waves across several industries. Besides being created/funded/produced by Netflix (typically a content distributor), it’s also making headlines in the marketing world. With a rumored cost of over $100 million for the first season ($3 MM+ an episode), many people are wondering how Netflix could afford to make the series, let alone make money on it. If you look closely, one theory becomes evident. 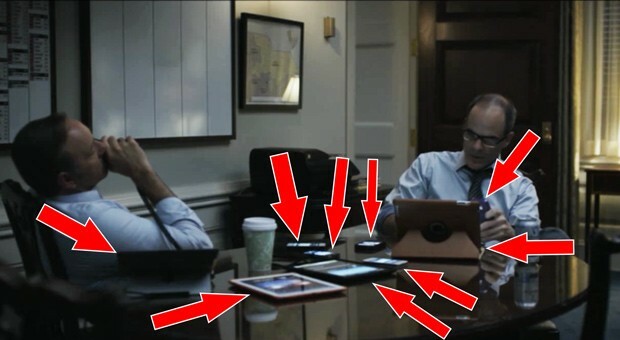 Popular tech blog Engadget has noted that in one scene, there are 9 Apple devices on a table and screens turned on. Even for a congressman, it seems excessive? According to one of their sources, Apple provided them with equipment to use in the film. While no money exchanged hands (officially), having a company gift equipment to use in film saves a significant part of the prop budget (and the overall budget of the film). Not only are actors/actresses using the products on the show, they are often talking about them, thus feeding into the thought that it’s a “personal recommendation” of a product. Also, since the entire season is available at once, there is nothing stopping people from pausing to research a company and/or product. This trend comes as good news to most companies. It’s much easier (and cheaper) for companies to provide products to studios then pay exorbitant amounts of money to have their products be featured. As long as everyone plays by the same “rules”, it also levels the playing field. (Coincidentally, only Apple has admitted to not pay anyone for product placement) The question remains if consumers will wise up to the trend and start tuning out the products. What do you think of Netflix’s choice?